A Shropshire wildlife group says it has evidence badgers have been illegally shot and then dumped on the roadside to make it look like they were roadkill. The Shropshire Badger Group said it started investigating after members found three animals on a country lane in Ellesmere in September. Tests revealed the animals were shot and X-rays showed pieces of cartridges. The group said they believed the animals were being shot by people trying to stop the spread of TB. Jim Ashley, from the group, said: "Usually when a badger is hit by a car, there is some damage around the head. "Badgers tend to turn to face the car at the last second and then they get hit - but this damage was just not consistent with that." He said the three animals had been found dead by a dog walker on the "very isolated lane" overnight on 21 September. He said the animal's bodies had been laid out in "an odd way" at equal distances away from each other. Mr Ashley said the post-mortem results a week later showed they had all been shot - one with a rifle. So why would anyone kill three badgers? Badgers are highly protected under UK law and deliberately killing one carries the threat of a fine and six months in prison. Of course it's unlikely the offenders will be identified in this case. There just isn't enough evidence to link anyone to the crime. What we can say though is if those responsible think ad hoc killing of badgers will help reduce the spread of bovine TB then they are wrong. The Krebs trial of culling here in the Midlands showed that killing a few badgers can cause the remaining animals to abandon their sett. If any of those animals are infected with bovine TB they then spread the disease. Killing badgers like this won't control the spread of bovine TB. It will make the problem worse. He said the incident had been reported to the police but there was "little" that could be done. He urged anyone who saw cars being used to dump items on similar-looking roads to contact police or the group. Mr Ashley said he had seen "quite a few" other badgers over the years which he suspected had been shot. He said: "They're left on the side of the road, presumably with the intention of being hit by a car afterwards so any evidence is obliterated." The Protection of Badgers Act 1992 makes it illegal to kill, injure or take badgers or to interfere with a badger sett. Last month, the first badgers were vaccinated as part of a scheme to cut the spread of tuberculosis (TB) among cattle in north Shropshire and south Cheshire. The five-year project, led by the Shropshire and Cheshire wildlife trusts, is in response to a badger cull trial in Gloucestershire and Somerset which has since been postponed by the government. Bovine TB cost UK farms about £100m in 2010 alone, the government said. Mr Ashley said anyone dumping badgers in this way was "doing the farming community a disservice" as it could lead to TB being spread to an area previously unaffected. 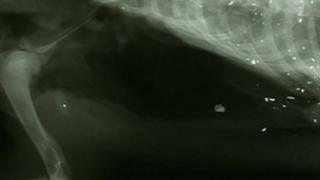 A spokesperson from West Mercia Police said the illegal shooting of badgers was not a "particular problem" in Shropshire.